I got up at 3:45. Moon River left her berth at Shoreham and went out through the 7am lock. 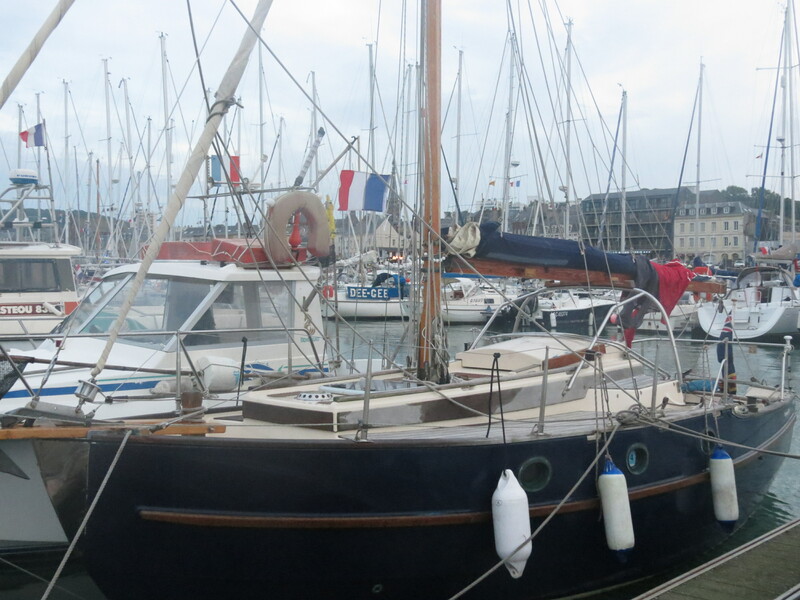 I hoisted the mainsail and motored out of the harbour. 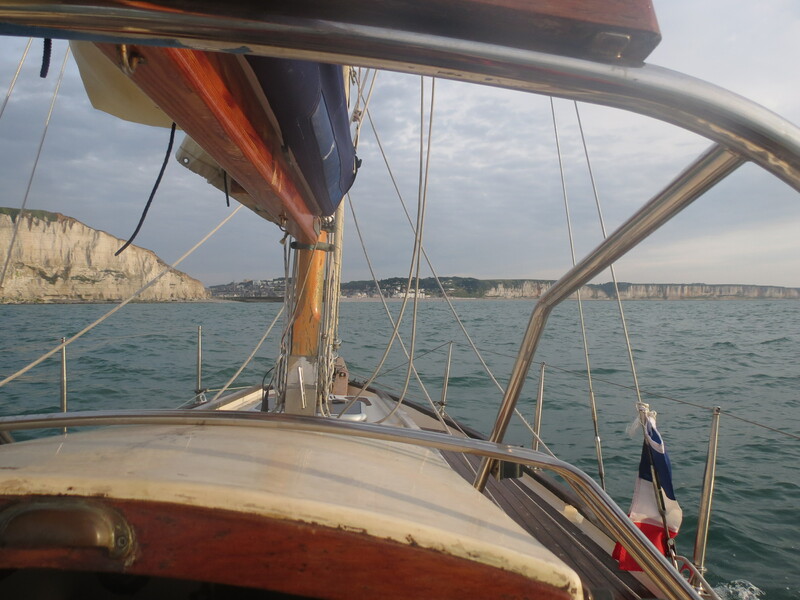 I set an initial course of 160° towards Fecamp. 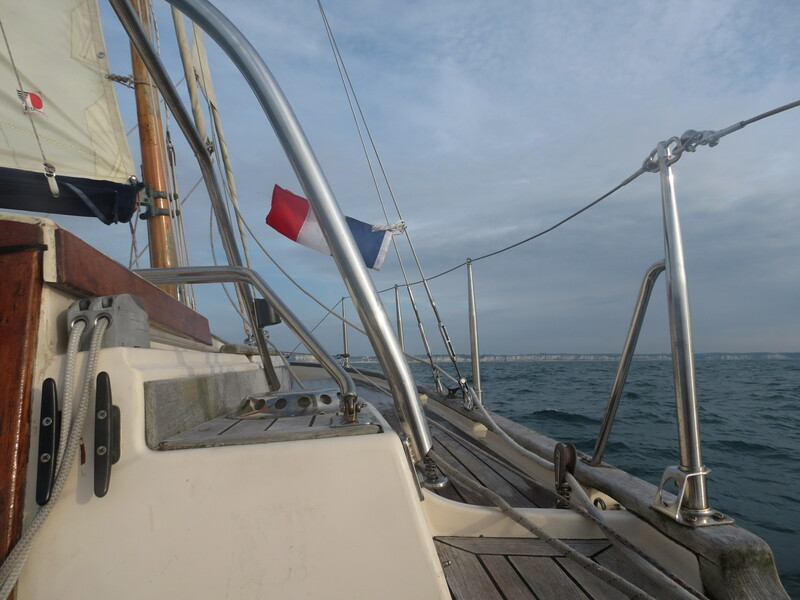 There was a light mainly Westerly breeze and smooth seas. 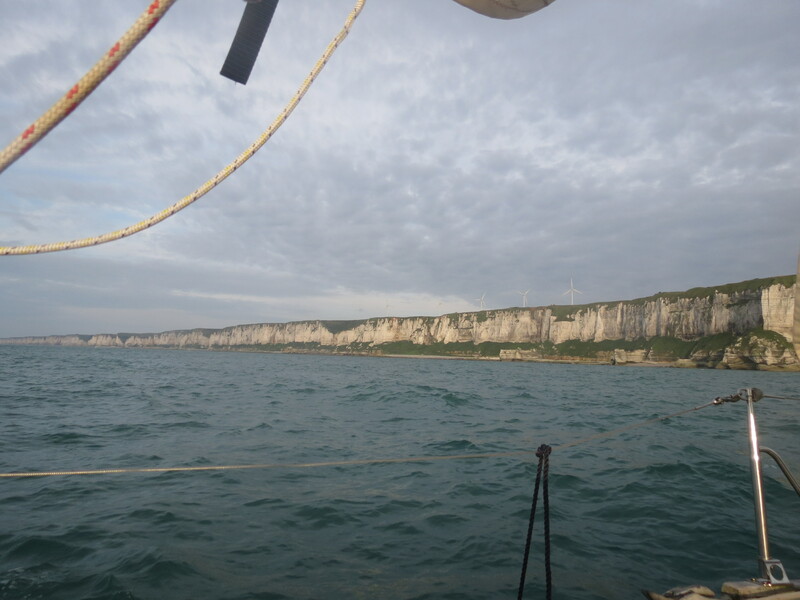 With an initially East flowing tide, Moon River made quite good progress – increasing to more than 6 knots over the ground. The visibility was poor and deteriorating. Moon River reached the East to West shipping lane at 11:00. By now the fog had descended in earnest and visibility was down to a few yards. I saw the first ghostly ship pass ahead of Moon River at 11:15. The 2nd was further ahead. They seemed to be spaced out so that I was able to judge the gap safely. The 3rd one passed behind Moon River. I wondered how well my new radar reflector was showing up. The next boat I saw ahead turned to starboard and started heading North. If it held its new course it would pass Moon River port to port. 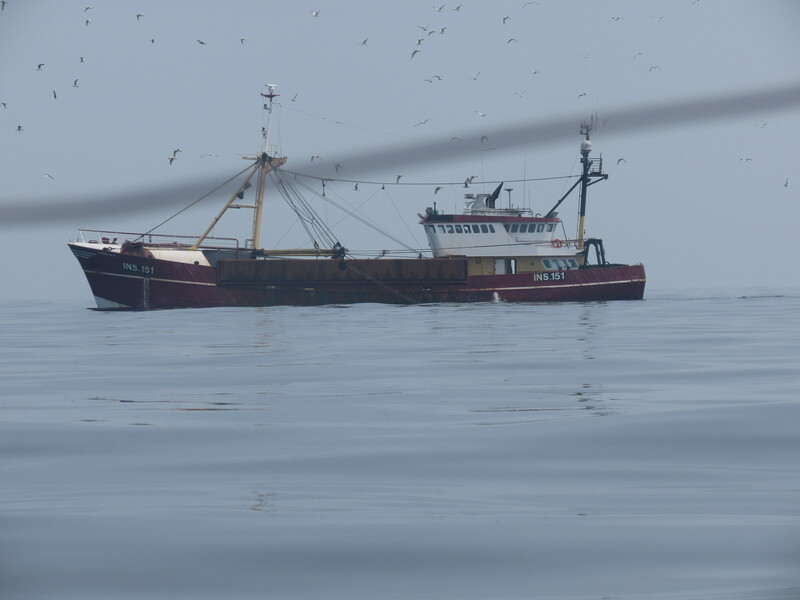 As it approached I saw that it was a fishing vessel. I could see it quite clearly as it eventually went by to port of Moon River. Then it turned to port and headed West behind Moon River. 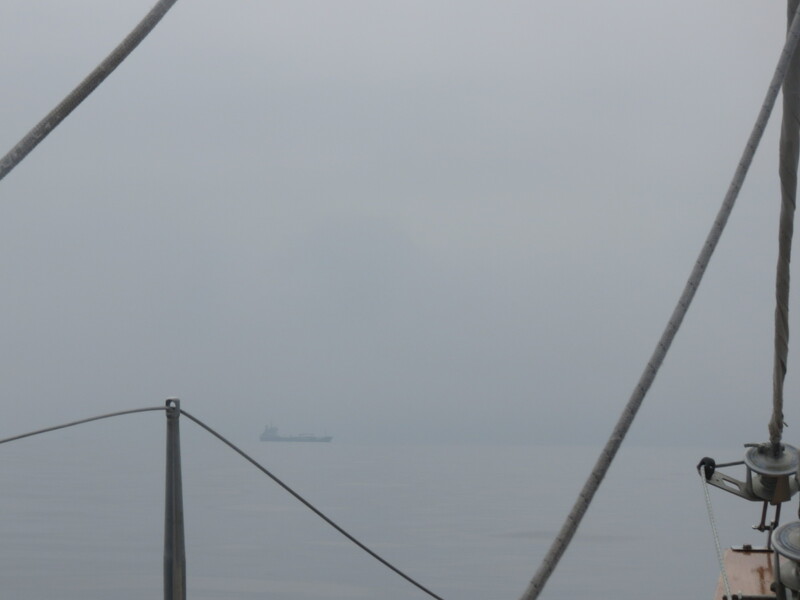 We entered the West to East shipping lane at 13:12, still in thick fog. I counted 6 ships passing ahead or astern of Moon River. The 6th ship passed astern at 13:55. I had to wind in the fore sails and head into wind to pass astern of the next one. We were now just leaving the shipping lane at 13:55, and within minutes the skies cleared. I saw a helicopter overhead. Moon River still had some 32 miles to Fecamp. For the next 7 hours Moon River continued on the same course. The wind gradually increased. At 18:00 BST I had my first sight of the French coast. 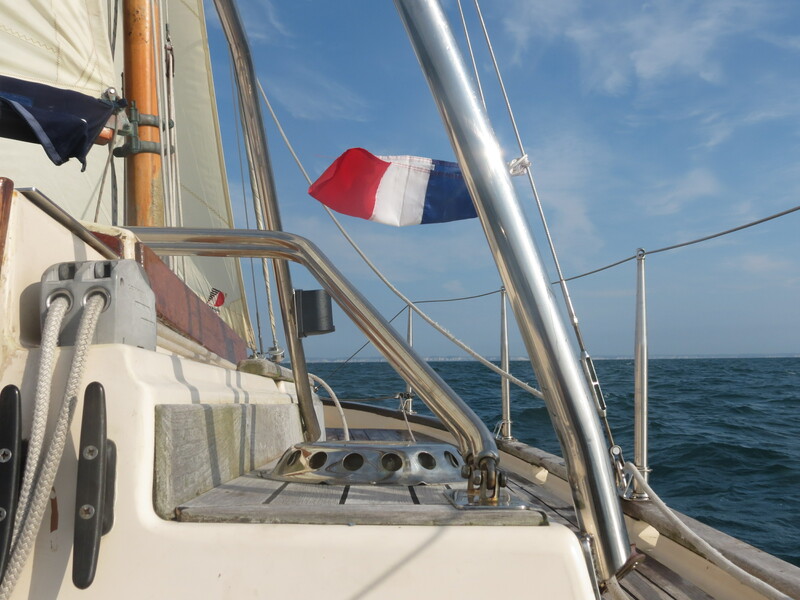 I fastened the French courtesy flag to the starboard shroud. The seas had built as the South Westerly wind increased. 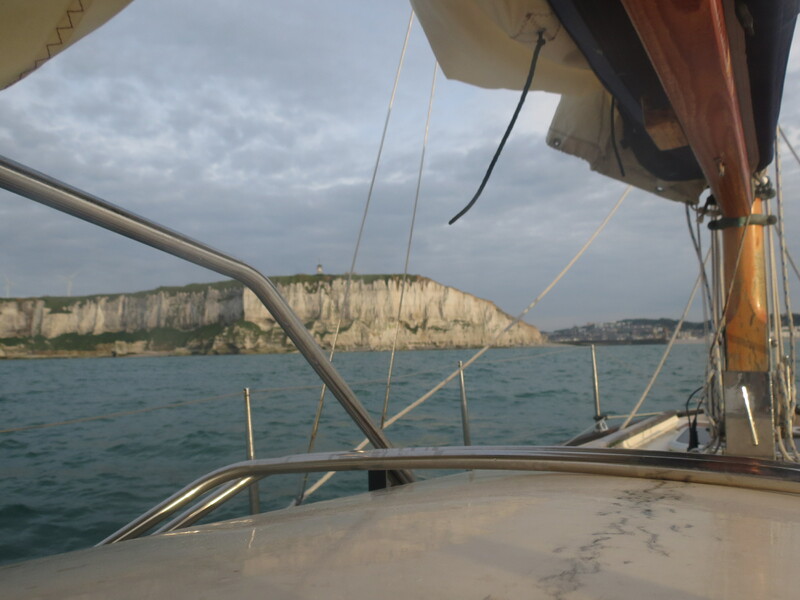 By 19:00 BST I could see the white cliffs East of Fecamp growing tantalisingly close as Moon River neared the French coast. 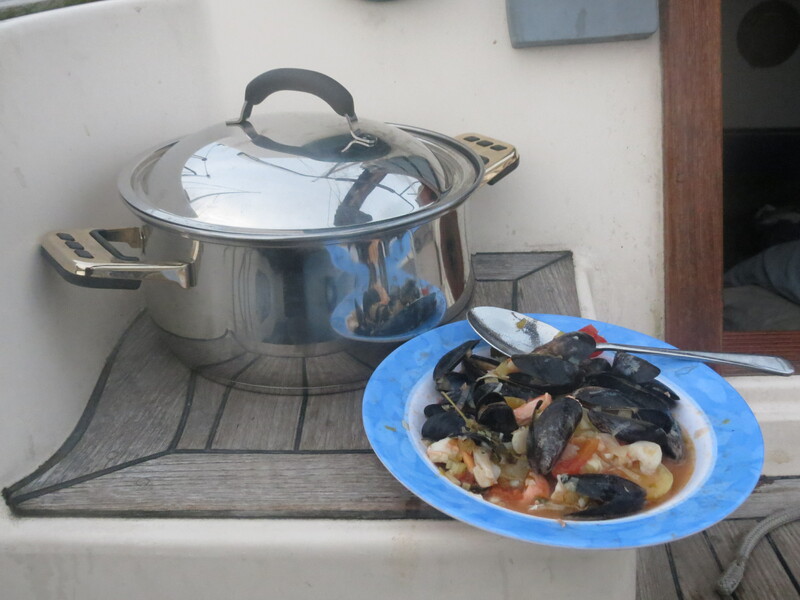 By now the winds had increased to at least SW5, and the seas were building with a nasty chop. Eventually at 19:30 BST Moon River reached the familiar headland. 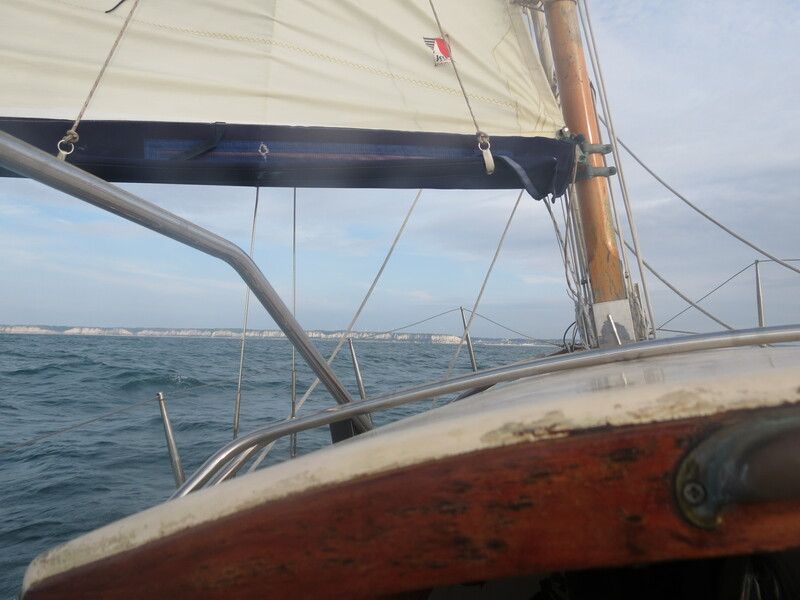 I dropped the mainsail, furled the staysail and jib and motored towards the harbour entrance. By now the SW wind was probably up to force 6. The outer harbour was packed. Every berth on the visitors’ pontoon was taken. Manoeuvring was challenging with the wind gusting even in the shelter of the harbour. Moon River moored on the only free berth on the adjacent fishing vessel pontoon at 20:00 BST (21:00 French Summer Time). This entry was posted in Netherlands Cross Country Tour. Bookmark the permalink.